An important part of creating value in a business is ensuring that the money invested in it is generating strong returns. 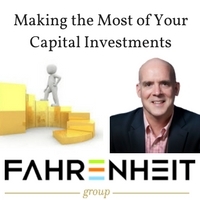 This discussion focuses on capital investments made in property, plant, and equipment, and best practice steps you can take to help get improved returns on them. To illustrate, we share a couple of mini case-studies at the end. A Review of the Basics: The owners of a business most often make capital investments with the expectation that they will earn an attractive financial return for doing so (there are exceptions, such as spending to meet regulatory requirements). As a brief reminder, you estimate returns on a capital investment by laying out all of the expected cash outflows and inflows related to the project, together with the anticipated timing for each. This permits the calculation of the projected Net Present Value (NPV), Internal Rate of Return (IRR), as well as payback period for the investment. Financial model with projections (financial and if applicable, operational). Your finance department should develop a standard format (i.e., spreadsheet) to be used for all projects to aid with understanding. Discuss the key assumptions of the project and what it’s expected to deliver. This will facilitate alignment of your team and make sure all facts are considered. It also sets the stage for developing KPI’s (Key Performance Indicators) to track and manage project performance. Understand the basis for financial projections, especially those that you do not directly control, such as revenue growth. Ideally you have test data, or insight from the performance of similar past projects. If hard data is lacking, you should: a) test the project on a limited basis before moving forward, or b) if testing is not feasible, use conservative assumptions and set contingency plans to deal with underperformance. Watch out for commonly missed items. Two categories of cash outflows that I have most often seen omitted are: a) follow-on investments or maintenance expenses required farther into the project, and b) direct variable expenses resulting from increased sales. The latter can include such items as incremental payroll, commissions, credit card fees, etc. Use caution when considering “soft benefits.” These can include things like employee morale and customer satisfaction. While certainly important, be careful not to let them lure you into making an investment that does not meet your financial goals. Pinpoint the exact source(s) of expected cost savings. For example, if a project’s cost savings come from reducing department workload by 20% and you have 5 employees, you must terminate (or legitimately reassign) one person or you will not realize the return on your investment. In fact, a great litmus test to use for support of a proposed project is whether the department requesting the investment is willing to reflect cost savings (or revenue increases, if applicable) in their budgets and performance targets. Consider project duration. If things are changing rapidly in your business, it often makes sense to use a shorter project time frame than the book life of the assets being deployed. This lessens the risk that the expected returns will not be delivered if conditions change and the project is terminated or scaled back. Be very critical when reviewing vendor-supplied assumptions. They can be overly optimistic and/or incomplete. You and your team need to have ownership in the assumptions, led by the accountable person you identified to lead the decision process. This reduces the chance of unpleasant surprises. Track and Manage. If a project is approved, tracking should start immediately. Generally, there will be two phases: 1) implementation, where the focus is on meeting project costs and timeline, and 2) operation, monitoring KPI’s and results versus expectations after the project is implemented. Tracking should be led by the person accountable to the project, with periodic reporting to company leadership (this can range from weekly to quarterly, depending on the nature of the project). This periodic review should include discussion of any significant variances in performance versus projections for financial results and KPI’s, along with action plans to address any issues. This was one of the best capital investment projects I have seen. The scope of the project was to reduce costs by replacing the fluorescent overhead lighting in our buildings with more efficient LED lights. The investment delivered fully on expected results. The right people were involved (led by the Facilities VP, supported by a manager on his team) and had full accountability to the project. It was easy to identify exactly how cost savings woud be delivered (utility bills). We did a limited-scale test of the project, and found costs slightly higher than expected due to required wiring changes at some locations. The assumptions were revised, the projected returns were determined to still be favorable, and a surprise was avoided. We were able to track and manage the project with clear milestones (installation schedule) and KPI’s (reduction in utility bills), which were projected by location and reflected in expense budgets. This was a disappointing and much less successful capital project that I saw earlier in my career. The scope of the project was to install small-package handling equipment in a warehouse to facilitate product picking and save on labor costs. While it still delivered some return, the result was well below expectations. There was a clear view as to how cost savings would be delivered (reduced labor costs in the warehouse). The roles were not clear as to who would be accountable for driving the investment decision, and who that person needed to support and advise them in the process. It was a relatively undefined group effort. Most of the analytics around pro-forma performance were prepared by a third party and were neither reviewed sufficiently nor signed off by those at the company who should have played support or advisory roles. As a result, there was a major inaccuracy in the assumptions driving the labor savings: They did not reflect that many of the smaller-sized SKU products were delivered to the warehouse by the vendor in large multi-unit “case packs” that were too large to fit into the small-package handling equipment. This was not discovered until implementation, significantly reducing the labor-saving benefits available, and lowering the return on the investment.